he 'one writer' alluded to in my last post was Camille Saint-Saëns, who, in his memoir Musical Memories, wrote an evocative remembrance of the woman who championed his music - Pauline Viardot-Garcia. Her voice was tremendously powerful, prodigious in its range, and it overcame all the difficulties in the art of singing. But this marvelous voice did not please everyone, for it was by no means smooth and velvety. Indeed, it was a little harsh and was likened to the taste of a bitter orange. But it was just the voice for a tragedy of an epic, for it was superhuman rather than human. Light things like Spanish songs and Chopin mazurkas which she used to transpose so that she could sing them, were completely transformed by that voice and became the playthings of an Amazon or of a giantess. She lent an incomparable grandeur to tragic parts and to the severe dignity of the oratorio. Superhuman rather than human, playthings of an Amazon or a giantess? No wonder she was a legend in her own time. 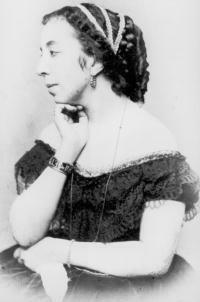 You can read Saint-Saëns' chapter on Viardot-Garcia here.